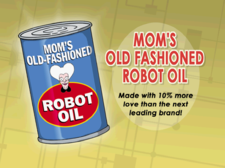 Mom's Old-Fashioned Robot Oil is the leading oil brand, advertised as containing 10% more love than the next leading brand. It is made by MomCorp, and its adverts have the lovable Mom talking to all her Robot children, trying to persuade them to buy her brand of robot oil. Unfortunately, as shown in "A Fishful of Dollars", Bender would rather steal Mom's Old-Fashioned Robot Oil than buy it. A "Mom's Moron Oil for Dumb Robots" sticker has appeared. It is most likely that it is a "joke" sticker for children and that no such product exists, however given the wide variety of their products; Momcorp may produce the stickers.